Redmi Note 6 Pro offers: After launching in many global markets, Xiaomi is has been launched Redmi Note 6 pro on 22nd November in India. Redmi Note 6 Pro offers almost similar hardware compare to Redmi note 5 pro such as Snapdragon 636 processor, 4000mah battery, 12MP+5MP dual rear camera. The minor changes over Redmi note 5 pro is now dual 20MP + 2MP front camera and notch design. Redmi Note 6 Pro Price at Flipkart is Rs.10199 for 4GB/64GB variant. As Redmi note 6 pro is already available in other global markets so this time Xiaomi decided not to create so much hype for the upcoming product launch. Simply they announced through social media platform. So stay tuned for the launch and exciting bank offers, discount and more. Now no need to wait for Redmi Note 6 pro Next Sale Date, as it is already available for purchase 24/7. What is Xiaomi Redmi Note 6 Pro Price in India? How is Redmi Note 6 Pro better than Redmi Note 5 Pro? What is Good & Bad in Redmi Note 6 Pro? Love photography? Grab the Quad camera all-rounder #RedmiNote6Pro today at 12 noon in @Flipkart's #BigShoppingDays sale. Additional 10% instant bank discount on @HDFC_Bank cards. Also available on https://t.co/cwYEXdVQIo. #RedmiNote6Pro packs a 20MP+2MP front dual camera with a f/2.0 aperture and 1.8?m 4-in-1 super pixel to offer you an unbeatable performance. One day offer: Flat ?500 off on @HDFC_Bank cards on https://t.co/cwYEXeds6Y. After the success of Redmi Note 5 Pro, Xiaomi is all set to launch the Redmi Note 6 Pro with ‘Four cameras, all-new AI portraits’ in India. The smartphone is expected to launch under the price bracket of Rs 20,000. Its quad camera setup includes two rear sensors - 12MP and 5MP; and two front sensors - 20MP and 2MP. The rear camera supports AI dynamic bokeh along with Dual Pixel Autofocus, while the Dual Selfie camera can shoot AI Portrait Selfies. Redmi Note 6 Pro offers facial recognition support on the selfie camera, and Electronic Image Stabilization (EIS) for video recording on rear camera sensors. Other Redmi Note 6 Pro specifications include up to 6GB RAM, up to 64GB in-built storage, the high-capacity 4,000 mAh battery that lasts more than a day on a single charge on moderate usage. In terms of processing, it features the same Qualcomm Snapdragon 636 chipset coupled with Adreno 509 GPU, that we saw on the highly successful Redmi Note 5 Pro. If you wish to buy this amazing smartphone, open your favourite shopping portal and make it yours. 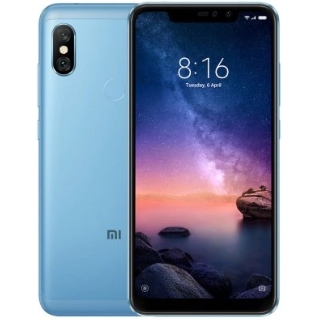 Besides you can make use of different Redmi Note 6 Pro offers such as Redmi Note 6 Pro Flipkart offers and Redmi Note 6 Pro discounts on Mi.com. Xiaomi has confirmed that "Redmi Note 6 pro" will be launched in India on 22nd November. stay tuned for more info! Xiaomi Redmi Note 6 Pro launch date has been set for 22nd November 2018 in India. The smartphone will be exclusively available on Mi.com and Flipkart, just like its predecessor Redmi Note 5 Pro. The new Xiaomi smartphone will release on 23rd November 2018, which is also the Redmi Note 6 Pro sale date. Once it launches and goes on its first sale, we will be updating the Redmi Note 6 Pro next sale date. The smartphone will go on sale via Flipkart with Redmi Note 6 Pro launch offers. Redmi Note 6 Pro price in India will be set under the Rs 20,000 bracket and is expected to be somewhere around Rs 17,000 citing the recent drop in the prices of Mi A2 and Redmi Note 5 Pro. Once the smartphone launches, the Redmi Note 6 Pro Flipkart price will be known along with the launch offers. Xiaomi Redmi Note 6 Pro will go on its first sale on 23rs November 2018 via Flipkart where the consumers can definitely make use of the available Redmi Note 6 Pro launch offers and discounts. The smartphone is expected to be released in two storage variants - 4GB RAM with 64GB storage and one with 6GB RAM and 64GB onboard storage. The smartphone will be up for its first sale on the Black Friday Sale on Flipkart. The smartphone will come with No Cost EMI and standard EMI offers, along with other bank discount benefits on all leading bank debit cards, credit cards and EMI transactions. Customers will also be able to take advantage of the Jio cashback and additional data offers on the purchase of Xiaomi Redmi Note 6 Pro from Mi.com as well as Flipkart. Redmi Note 6 Pro is surely an upgrade over its predecessor Redmi Note 5 Pro as it features an all-new notch display in the Redmi Note series with dual front facing cameras, making it the first Xiaomi smartphone to feature AI quad cameras. With AI Dynamic Bokeh feature on the Redmi Note 6 Pro you can control the depth and bokeh concentration in your images, even after clicking pictures. The rear cameras now feature EIS for video recording. The new Xiaomi smartphone also comes with Dual-band Wi-Fi connectivity at 2.4GHz and 5GHz, along with Bluetooth 5.0. Redmi Note 6 Pro flaunts a bigger 6.26-inch display over Redmi Note 6 Pro’s 5.99-inch display. Black friday sale - HDFC going to offer great discount on Redmi Note 6 pro via HDFC debit & Credit cards. Q:Does Redmi Note 6 Pro support Hindi language? Q:Can I use two apps on the same screen on Redmi Note 6 Pro? Q:What is the display resolution in Redmi Note 6 Pro? Q:Can I hide the notch in Redmi Note 6 Pro?